ON TELEVISION: Conan O'Brien is the best there is right now on late night TV. He took that spot over from Letterman long ago, though Dave still shows signs of his early brilliance! With Conan taking over the Tonight Show from Jay Leno - necessitating a shift in time and a change geography (LA). 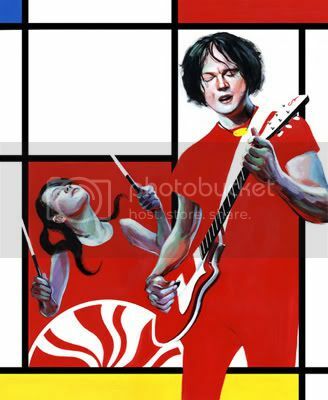 That means tonight's White Stripes performance will be their last ever time on Late Night with Conan O'Brien. Who knows what will happen? Ahhhh, a resurrected Stripes show! (The band has been on hiatus with Meg's confirmed bout with stage fright and the huge success of Jack's other band - the Raconteurs.) And then there's the strong and long-standing friendship between the White Stripes and Conan. The story of how they met and their NUMEROUS live appearances is rather interesting. (HIGHLY RECOMMENDED!) Either way, this is going to be good!